The collection of a key 20th century English writer. The International Anthony Burgess Foundation (IABF) was established in 2003. Based in Manchester, it is an independent charity supporting interest in the life and works of Anthony Burgess. Burgess is well known as a writer, but among his many talents Burgess was also a prolific composer, and the IABF reading room holds many rare and interesting items relating to this aspect of his career, including manuscripts of musical works - many of which have never been performed. When the MINIM-UK project was announced, we received a message from the International Anthony Burgess Foundation Archivist, Anna Edwards, to inform us that their collection is home to a number of instruments which belonged to Anthony Burgess and his family. 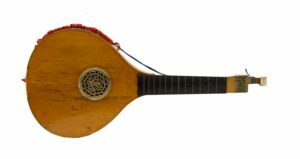 In October 2016, we visited to document, catalogue, and photograph these instruments, where we stumbled across a wide array of items: a broad collection of wind instruments, bagpipes, non-Western instruments, and a hitherto unidentified English guitar. An English guitar from the collection of Anthony Burgess. 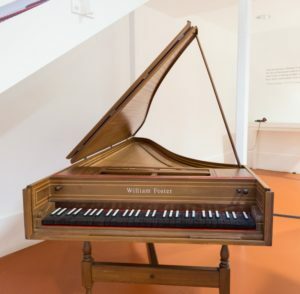 The collection also features a modern harpsichord by William Foster that was the inspiration for the instrument featured in Anthony Burgess's historical novel, Earthly Powers. A modern harpsichord by William Foster.